Well, so far, I'm still workin' out of my pantry folks! This is solid proof how great it is to keep a well-stocked pantry and especially a well-stocked freezer. While I am beginning to run out of basic things like milk and yellow onions, we've still got plenty to choose from to build great meals right out of the pantry. Today I had exactly one banana left and just a little bit of walnuts, so I thought I would add to my Oatmeal Chronicles by doing an oatmeal with banana today. Now I just love my banana bread that has a bit of citrus in it, including fresh lemon juice, so I thought that I would try a little bit of lemon with the banana in my oatmeal and I'm so glad I did. It adds just a wonderful bit of tartness that was just delicious with the sweetness of the honey. Don't have fresh lemons this time? Well here's a tip that will ensure that in the future you always do! In the pantry I also had one sleeve of honey graham crackers left in an opened package, so I decided to take one-half of a cracker and crumble that up to top off the oatmeal. Lemon with banana, topped with a little honey graham and finished with a nice drizzle of honey ... a really great way to start the day! Nutritional Factoid: Did you know that flaxseed is extremely high in Omega-3 essential fatty acids, the good fat? And, doctors are looking at it for its possible effects on lowering cholesterol, stabilizing blood sugar, lowering the risk of breast, prostate, and colon cancers, and reducing the inflammation of arthritis, as well as the inflammation that accompanies certain illnesses such as Parkinson's disease and asthma? (Source: WebMD) So when you can, add it into your foods! Slice the banana and toss with the lemon juice; set aside. Combine the oatmeal, water, salt, most of the chopped walnut and the flax meal in a large microwave save bowl. Microwave for between 3 to 5 minutes, or until oatmeal is creamy. Microwaves vary so it may take more or less time with your microwave. Remove, stir in most of the banana with the lemon juice, reserving a few slices for garnish and drizzle with about 1/2 of the honey; gently stir to combine. Transfer to serving bowls. Top each serving with a couple of banana slices, sprinkle with the crushed honey graham cracker, and drizzle the remaining honey all over the top. If you're not watching your fat and calories, melt a little bit of butter and drizzle that over the top of those graham crackers and around the top of the oatmeal too. Finish with just a drizzle of cream right around the edges of the bowl, if desired. 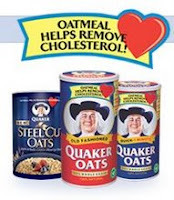 The Quaker package lists this serving size as the "Heart Healthy Serving Size" providing 3 grams of soluble fiber, but it is quite a lot and certainly enough to split into 2 servings. Mmmm, that'll warm ya up.